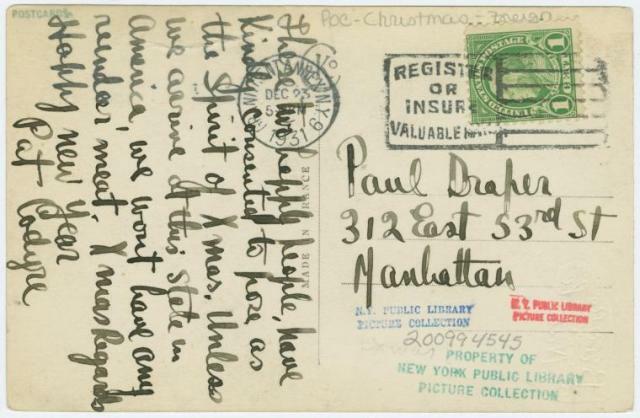 In an effort to make a suitably festive holiday post, I went looking around the NYPL Digital Gallery for an image from a “vintage” (oops, I mean “archival”) greeting card. My goal was to find something that either featured performers or had even some tangential connection to the performing arts. But when I came across this striking postcard, I was stopped in my tracks. OK, the couple may not be performers, but both of them are attractive in a matinee-idolish sort of way. And, with time running out, it certainly was quirky enough for the purposes of this blog. 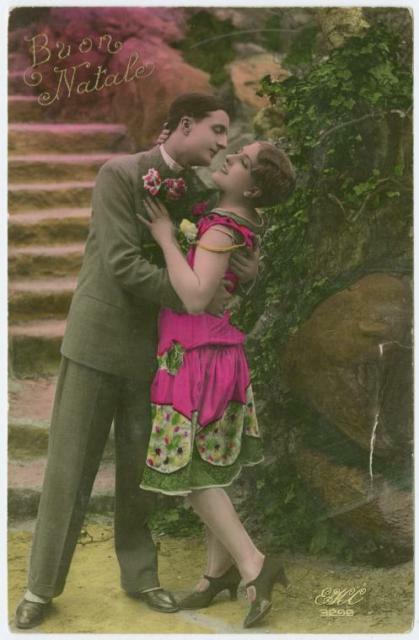 This postcard had been sent in 1931 to a Paul Draper of Manhattan. Could the intended recipient have been Paul Draper, the famous tap dancer? The possibility was exciting, but after quickly checking a few other sources, it seemed likely that Draper would have been in Europe at the time the postcard was sent. But maybe. A glance over at Wikipedia’s disambiguation page (hate that “term”!) reveals a handful of other potential Paul Drapers, although the Library of Congress Authorities File, by providing dates, makes it easier to eliminate some false leads in this particular instance. Similarly, there are a few likely Pat Cordyres from that period (but a former Museum of Modern Art employee may be the most promising potential postcard writer, or, the most intriguing, at any rate). Or maybe this Paul is a long lost relative of Don Draper? That might go a long way towards explaining the mysterious content of the message itself. While I probably could write a lengthy jeremiad on the deficiencies of the descriptive metadata associated with this particular digital image set, it wouldn’t be in keeping with the holiday spirit (and I don’t want to be dissing friends). Instead I invite all of you professionals out there to play the social metadata game and send in your tags. Show those civilians on Flickr Commons what a real archivist can do! At the very least, stumbling across this image has enabled me to not let the Paul Draper centenary go by completely unremarked before the year has passed. So, happy belated 100th birthday to Paul Draper! And “buon natale,” or, happy whatever holiday it is you are celebrating, to you all! 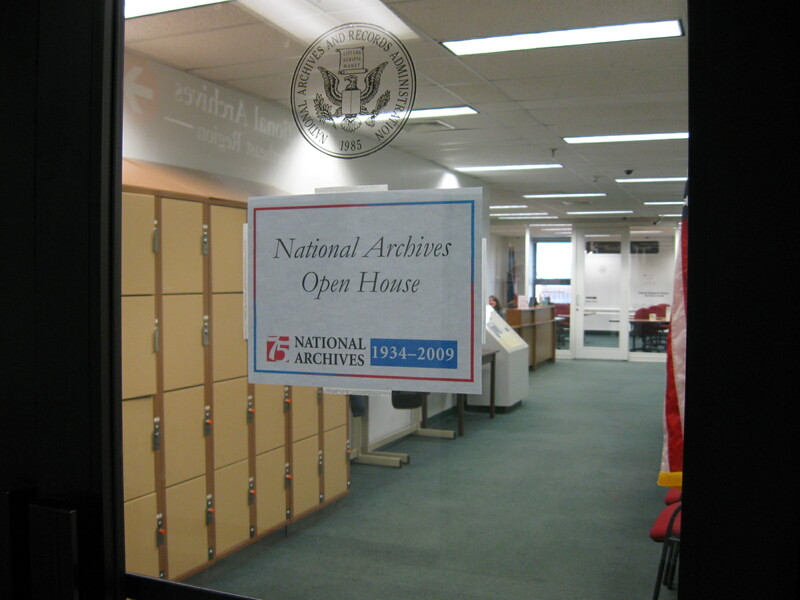 The Northeast Region (located in New York City) of National Archives and Records Administration (NARA) had an open house on October 13, 2009. 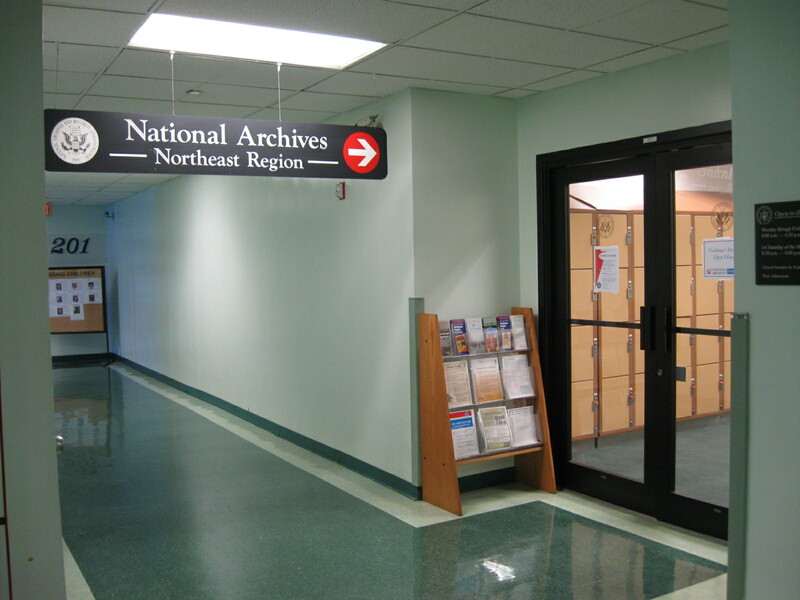 For those who had never used the New York center of archives (covering NY, New Jersey, Puerto Rico and the U.S. Virgin Islands), it was a great opportunity to get acquainted with the resources of the facility. 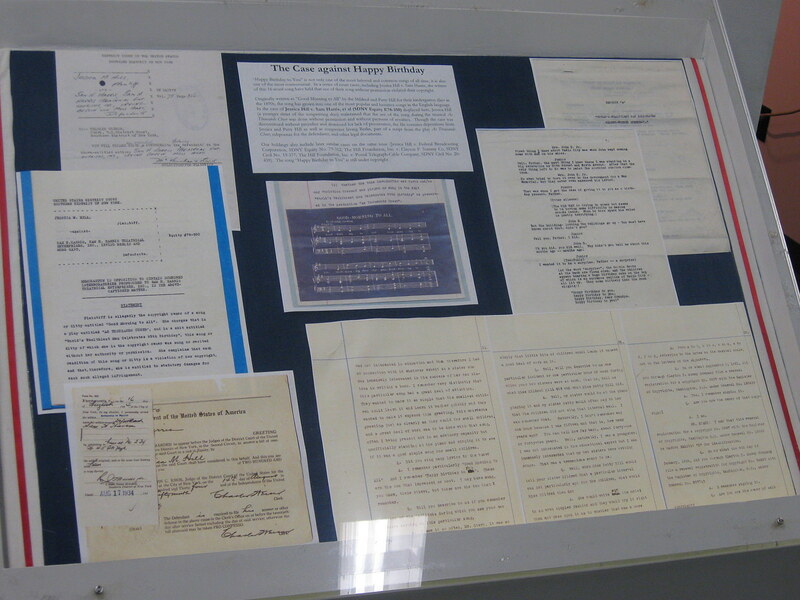 Though I was there on work-related business, it overlapped with my genealogy hobby. There were a number of genealogists there, too. Dorothy Dougherty (NARA staff in charge of public programs) showed a video from their website and provided an overview of the history of the United States and its archives. The value in going through the institution’s history helped explain why certain materials are not there. Although everyone had a chuckle as she went through a history of the fires (there had been many), it was quite instructive in revealing why certain records no longer exist, and why others do exist even if you would expect them not to be around. That’s the reason the 1890 US census is mostly gone – it was consumed by fire because it was being stored at the Department of Commerce, rather than the area where the rest of the censuses were kept. 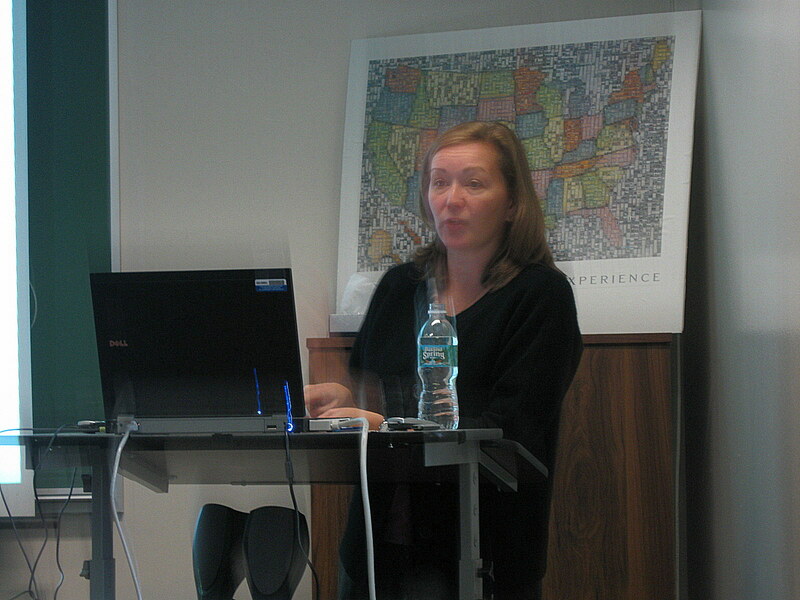 She concluded her talk with a quick tour of how to navigate NARA’s website. Staff showed us some interesting artifacts followed by a brief behind-the-scenes walking tour of their stack area. To say there is tons of material is an understatement. It seems as if the New York office is loaded with records of ship crews docking in New York for the past 200 years (ship captains had to keep inventories of crews to determine when any of them would stay behind). Virtually any federal activity that took place in the New York region (which includes New Jersey, Puerto Rico, and the Virgin Islands) is kept mostly in the New York office (at 201Varick St. – literally at the Houston St. stop on the no. 1 train). Of the 9 full-time staff members in the New York office, 2 of them are devoted to programming and outreach. If a group wants to meet in the archives and have (or customize) their own tour, Ms. Dougherty would be one of the people to arrange such things. Seems like a great opportunity to plan a visit for a group. 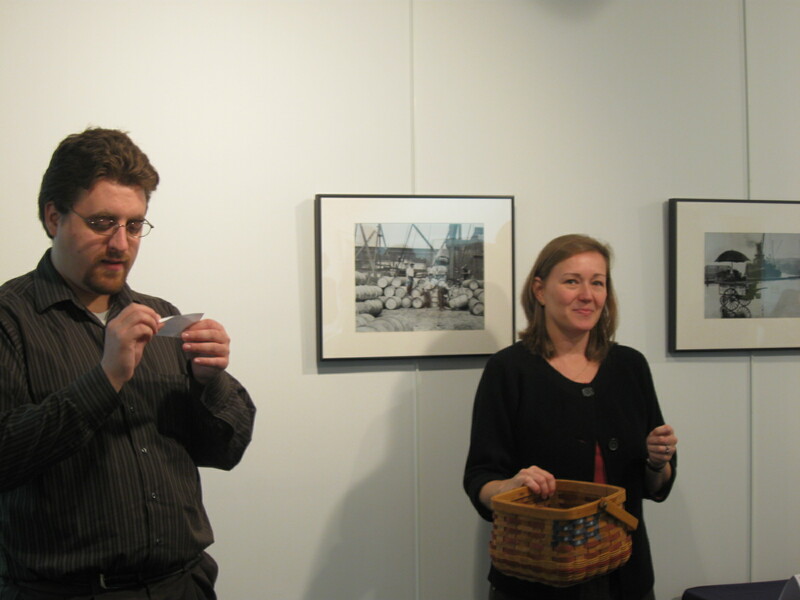 After the tour, the staff held a raffle of several copies of a newly published book of photographs from the archive. After the official end of the program, NARA staff was eager to answer questions from individual attendees. It was very pleasant and educational visit (I need more time to pursue some genealogy threads!). I highly recommend groups contact Ms. Dougherty and arrange a group visit. Afterwards, staff was eager to answer individuals’s queries. Throughout history, capturing performance through various media has been challenging. 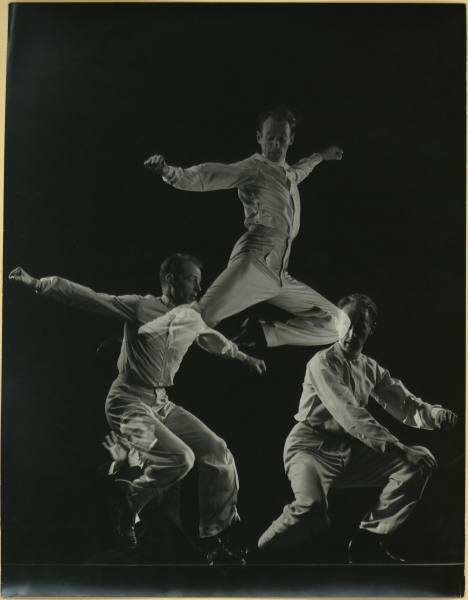 Performance historians have based their work on archeological artifacts, paper records, oral history and memory, audio recordings, and film documentation of dance and theater performances. Each method – in itself ephemeral – presents challenges due in part to limitations inherent in its physical characteristics: images fade, paper crumbles, and memory fails. This session will address and assess past, current, and future methodologies for harnessing the power of performance – and the extent to which these approaches and strategies support or impede research. We invite papers addressing the many forms of documentation – from depictions of Athenian performances on vases to computer-generated dance notation/animation. How do documentation strategies negotiate, undermine, or emphasize power? How do developments and changes in technology impact performance studies? How do cultural politics and the power of societal perceptions of theater and dance affect performance documentation? How do documentation strategies or models strengthen or undermine our understanding and appreciation of performance? How have theater and dance practitioners, librarians and scholars collaborated to develop effective documentation strategies? What are the limitations and drawbacks of video and film documentation of performance? How will the proliferation of born-digital objects impact documentation of theater and dance? Do artists have the ethical right to resolve that their work may perish with them? I really thought I already had written a blog post about this great project developed under the auspices of the Center for Documentary Studies at Duke University, but it still must be sitting in my ever-expanding pile of good intentions. At any rate, I must say that I have been enjoying the NPR radio series about the 4,000 hours or so of audio recordings made by Life magazine photographer W. Eugene Smith at the New York City loft space he rented at 821 Sixth Avenue between the years 1957 and 1965. I also am delighted to discover that the Project has now sprouted a book and a blog, and, soon, an exhibition at the New York Public Library for the Performing Arts! In addition to documenting the sounds of now-legendary jazz artists in their prime and the changing New York cityscape, Smith also recorded those other kinds of cats in the loft that tried to keep the vermin at bay. Sadly, the Jazz Loft Project Web site does not yet include any cat recordings (you can hear a fragment on one of the radio broadcasts), but they do provide a lovely image of a solitary cat on the site’s “Primary” slide show (no. 24) for your viewing pleasure. I guess they’re not too concerned with marketing to librarians and archivists at this point.